The high-temperature coarsening behavior of γ′ precipitates in a series of NiAlCr, NiAlCrTi, NiAlCrW, and NiAlCrTa single-crystal alloys was determined at temperatures between 1158 K and 1473 K (885 °C and 1200 °C). For this purpose, samples were supersolvus solution treated, water quenched, and then subsolvus aged for times between 0.067 and 96 hours. All of the measurements revealed an r3 dependence of the average precipitate radius on time, thus suggesting bulk-diffusion control of the coarsening process. Coarsening kinetics were fastest for NiCrAl and slowest for NiCrAlTa. The observations were interpreted in terms of the classical Lifshitz–Slyosov–Wagner (LSW) theory modified to account for the finite volume fraction of particles, the composition of the precipitates, and the multicomponent nature of the alloys. By this means, an effective diffusivity for the coarsening process was determined and found to lie between 0.6 and 1.5 times that for the impurity diffusivity of chromium in nickel. Furthermore, the modified LSW theory in conjunction with experimental measurements suggested that the effective diffusivity controlling γ′ coarsening at high temperatures in multi-component nickel-base superalloys lay in the lower portion of this range. Manuscript submitted November 5, 2018. 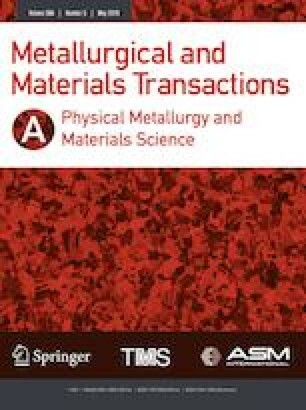 This work was conducted as part of the in-house research of the Metals Branch of the Air Force Research Laboratory’s Materials and Manufacturing Directorate and the Advanced Metallic Materials Branch of the NASA Glenn Research Center. The yeoman assistance of T.M. Brown, R.E. Turner, and C.P. Lingane in conducting the experiments is gratefully acknowledged. Two of the authors (NCL, ARCG) were supported under the auspices of Contract FA8650-15-D-5230.